Recombinetics Inc. is seeking $10 million in funding as it ramps up sales of its genetically tweaked animals. The St. Paul-based biotech company’s recent round has already brought in about about $2.8 million from friends and family, said Chief Operating Officer Kyle Dawley. Company officials hope to close out the round within the next two months and add about 10 employees to its staff of 25. Recombinetics uses gene-editing technology to tweak animals for the agribusiness and biomedical markets. 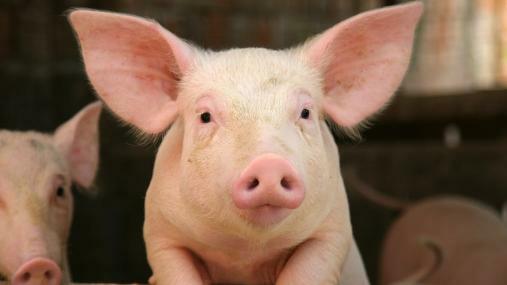 It’s biomedical business centers around pigs, which the company modifies for research purposes. That side of the company’s business already generates revenue, Dawley said, though he declined to reveal sales figures. The company focuses on pigs, touting them as better research subjects than mice when it comes to testing medical devices and drugs for use in humans. “Pigs are — size-wise and genetically — a lot more like humans than rats and mice,” Dawley said. One of Recombinetics’ long-term goals is grow human organs inside pigs. The company aims to modify livestock for food consumption as well. One of its projects calls for creating hornless cattle by taking a gene from one breed and putting into another. Recombinetics expects food ventures may get a boost from the Food and Drug Administration’s recent approval of a genetically engineered salmon called “AquAdvantage.” The fish grows faster than traditional salmon thanks to the introduction of trout genes. Recombinetics has raised $15 million since its founding. Katharine Grayson covers med tech, clean tech, technology, health care and venture capital. See also Surrogen, Inc., which produces transgenic pigs for purpose of large animal models of disease. For the past five decades, Ralph Brinster, VMD, PhD, Richard King Mellon Professor of Reproductive Physiology at the University of Pennsylvania’s School of Veterinary Medicine, has been working on furthering our understanding of the mammalian germ line. During that time, he helped forge the path that today’s biologists—including those working on transgenics and stem cell research—are following. Brinster is often referred to as the “Father of Transgenesis,” the study of the experimental transfer of individual genes or DNA into the germ line of an animal, which then transmits the genetic alteration to offspring and successive generations. Many may remember the famous Nature cover story of 1982 that showed a normal-sized white mouse being dwarfed by his giant mouse sibling. That was Brinster’s work, along with his colleague Richard Palmiter of the University of Washington. Through painstaking experimentation, during which they inserted new genes into the germ line, Brinster and Palmiter demonstrated, in a dramatic and unequivocal manner, the true promise of transgenics. The “giant mouse” research was reported on the front page of most major newspapers around the globe. For his groundbreaking work, Brinster was named one of seven scientists to win the National Medal of Science in 2010, a highly prestigious award that is given annually by the president of the United States. Brinster is the first veterinarian to be so honored and only the eighth from the University of Pennsylvania in the 50-year history of the medal. Penn researcher shares insights of 50 years studying mammalian germ line. Brinster was recently recognized for his 50 years of dedicated service as a faculty member in the Department of Animal Biology. The university and school held a two-day symposium in his honor, and research scientists from around the world participated. Michael Brown, a Nobel Laureate in Physiology or Medicine, presented the keynote lecture at the symposium.Brinster is often referred to as the “Father of Transgenesis,” the study of the experimental transfer of individual genes or DNA into the germ line of an animal, which then transmits the genetic alteration to offspring and successive generations. Many may remember the famous Nature cover story of 1982 that showed a normal-sized white mouse being dwarfed by his giant mouse sibling. That was Brinster’s work, along with his colleague Richard Palmiter of the University of Washington. Through painstaking experimentation, during which they inserted new genes into the germ line, Brinster and Palmiter demonstrated, in a dramatic and unequivocal manner, the true promise of transgenics. The “giant mouse” research was reported on the front page of most major newspapers around the globe. An exceptional honor: Brinster is the only veterinarian to receive the National Medal of Science, presented last year by President Obama. For his groundbreaking work, Brinster was named one of seven scientists to win the National Medal of Science in 2010, a highly prestigious award that is given annually by the president of the United States. Brinster is the first veterinarian to be so honored and only the eighth from the University of Pennsylvania in the 50-year history of the medal. He received his medal in October 2011 from President Obama himself during a ceremony held at the White House. In August of this year, the Theriogenology Foundation presented the 2012 Career Excellence in Theriogenology Award for his contributions to the field of reproductive veterinary medicine.DVM Newsmagazine recently caught up with Dr. Brinster in his office at the University of Pennsylvania School of Veterinary Medicine in Philadelphia. DVM: How did you decide to work on the mammalian germ line? Brinster: I grew up on a farm where we raised purebred animals. Genetics was fundamental on the farm in terms of breeding success and the potential profit gained from that endeavor. I learned at an early age that you must improve animal germ lines to succeed. Three separate stages are important to consider in studying germ lines: Pedigree tells you what you think you should get. Performance is what you actually get. And progeny is what can be passed on to offspring. For example, a horse can have a great pedigree but never win a race, or be a great racer but never sire winners. So in the end you depend on progeny to ultimately prove the power, quality and characteristics of the germ line of an animal. DVM: What excited you about work with germ cells? Brinster: They are the only cells that biology really cares about. What is important to the biology of the species is actually the DNA in the gametes or germ cells. Therefore, on the basis of my background on the farm, my animal science training at Rutgers and my education in veterinary medicine, I felt they were the most important cells in any animal. DVM: You started using stem cells in the 1970s, demonstrating that non-embryo-injected cells become part of the developing mouse. Why did you start that research? Brinster: I believed that the introduction of stem cells early in development would allow them to take part in maturation of tissues. These are the studies that resulted in the teratocarcinoma cells being injected into blastocysts. While we were trying to explore techniques to get better teratocarcinoma cells or similar cells to enter the germ line, I began developing techniques that might allow the introduction of genes directly into fertilized eggs. At first we worked with chromosomes, but they were difficult to handle. Fortunately, other scientists were developing recombinant DNA techniques, which made pure populations of specific genes available. It was difficult to obtain funding for these studies because the probability of success appeared very low. To obtain funding for this type of study, injecting eggs with nucleic acids, I began studies putting messages for proteins into eggs to study the mechanisms by which the egg produced the specific proteins. One of the proteins I planned to study was ova albumin, and Richard Palmiter had done excellent studies with this protein. I contacted him to obtain the messenger RNA. However, he had stopped working on ova albumin and was working with metallothionein genes. Although I was already working with several molecular biologists and trying to introduce new genes into eggs, I was interested in other possible genes, but the metallothionein gene was present in mice, and there was no good assay to distinguish it from the endogenous protein. However, I used the ova albumin messenger RNA for my protein studies, and later described these studies to Richard. At that time, he told me he was fusing the metallothionein promoter to the herpes simplex virus thymidine kinase gene, for which I had an assay. So I asked Richard to send me the fusion gene, and we began collaborating on microinjection of the gene into eggs. In the spring of 1981, we obtained transgenic mice expressing the metallothionein thymidine kinase fusion gene, and Richard and I then published the results of these studies in Cell several months later. DVM: Tell us about the giant-mouse experiment of the early 1980s. Brinster: I was very interested in making changes in the biology of the mouse using the transgenic technology, and one of the changes I envisioned was a correction of genetic defects. Richard and I discussed this project, which eventually led to the use of the metallothionein-growth hormone fusion gene in an attempt to correct the genetic defect in the “little” mice. The experiment was a success and was published in Nature 30 years ago this December. The effect was dramatic, and the experiment catalyzed interest in the transgenic technique among scientists as well as the general public. A picture of a large mouse next to its normal-sized sibling was published on the cover of Natureand appeared on the front page of most newspapers throughout the world. DVM: I remember that photo. I was stunned by it and the research it represented. That must have been exciting for you, to get that much recognition for your work. Brinster: Yes, I was surprised. The phone did not stop ringing for the entire day the picture appeared on the Nature cover. It brought a great deal of recognition to the scientific area and to our work, as well as the experiments of others working and contributing in this area. DVM: What are your thoughts on the state of veterinary stem cell research today? Brinster: It is critically important to understand how tissues develop, both normally and abnormally. I am not surprised that researchers are now studying the stem cell basis of cancer. I felt in the 1970s, when I was studying the teratocarcinoma cell, that all cancers must have a stem cell basis. It seemed logical that the cancer, like any self-perpetuating tissue, must have a stem cell basis, as well as a differentiation process, which is unregulated in cancer. The study of stem cells, including those of cancer, is an important area of investigation within veterinary medicine. Many veterinary schools are currently involved in innovative stem cell research. DVM: What are you working on now? Brinster: I am still studying the mammalian germ line and germ line cells. One area of investigation is related to human spermatogonial stem cells. About 80 percent of children with cancer are cured, but almost one-third of the prepubertal boys that recover become infertile or severely subfertile, which is a serious quality-of-life issue. About one in 5,000 reproductive-age men currently are cancer survivors with seriously impaired fertility. One method to alleviate this problem is to obtain a testicular biopsy before cancer treatment begins, and then use the stem cells from this cryopreserved biopsy at a later time to correct infertility. To be successful one must be able to expand the number of stem cells in the biopsy. Therefore, one of the main areas on which we have been working, in collaboration with researchers from the Children’s Hospital of Philadelphia, is the cultivation of human spermatogonial stem cells. This has proven to be very difficult, but I am sure we will be successful. DVM: You are the only veterinarian to ever receive the National Medal of Science. What was that day like for you, meeting President Obama in the White House? Brinster: It was extremely rewarding to be recognized by such a distinguished jury as the one that selects National Medal of Science winners. The ceremony itself was exceptional, and winning the Medal of Science brought well-deserved recognition to the School of Veterinary Medicine, my department and Penn. DVM: What do you think your legacy in the veterinary and the broader scientific community will be? Brinster: I think I will be recognized for my work on transgenics, in part because it has been tremendously important as a scientific breakthrough. However, many believe that it represents more, because it provides a method by which man can experimentally modify the germ line of species and thus change the “program of life.” This ability is a major change in man’s relationship to other species. DVM: What changes have you seen in your 50 years teaching in veterinary school? Brinster: The diversity of opportunities for students in their veterinary education and the many areas in which they can use their training following graduation is now enormous. They can contribute to many aspects of society now, and veterinary medicine has become critical to a wide range of problems. One particular area in which veterinary medicine will be especially important is related to zoonotic diseases. Approximately 70 percent of new infectious diseases affecting humans currently arise from animals, which represent the reservoir. This is just one example of an area in which veterinarians are critically important to societal health. Donna Loyle, MS, is a freelance writer in Philadelphia who specializes in medicine and veterinary science. If you ask Ralph L. Brinster, VMD, PhD the secret to his success, he will say it is luck. But if you ask anyone else — including colleagues with whom he has worked for more than five decades — they will tell you it is much more than that — it is brilliance and unyielding curiosity. Dr. Brinster, the Richard King Mellon Professor of Reproductive Physiology at Penn Vet, was one of seven scientists to be honored by President Barack Obama in October 2011 with a 2010 National Medal of Science, the highest accolade bestowed by the United States government on scientists and engineers. Since the award was first established 50 years ago, Dr. Brinster is the first veterinarian and the eighth scientist from Penn to win the National Medal of Science. The reason for this highest of honors? Dr. Brinster is often regarded as the father of transgenesis, and it was his research on the manipulation of the mammalian germ line, the cells that give rise to sperm and eggs, for which he was honored. By inserting new genes into the germ line of a developing organism — the process known as transgenesis — researchers can produce animals with selected traits that are indispensible models in understanding life processes and disease. Penn President Amy Gutmann said, “Ralph Brinster is a trailblazer in the field of reproductive biology and genetics whose work has had inestimable influence in science and medicine. His early findings helped usher in the era of transgenic research and represent foundational aspects of techniques used in genetic engineering, in vitro fertilization and cloning. We are extraordinarily proud that he has received the National Medal of Science in recognition of more than five decades of scientific achievement.” Clearly, it took something more than simple luck. The Path to Discovery “I grew up on a small farm in northern New Jersey, and from my experiences there, I became interested in animal development and breeding, including fertility and transmission of genetic characteristics to progeny,” said Dr. Brinster. “Growing up on a farm was a good environment. You work hard and there are no vacations.” That environment and value system paved the way for Dr. Brinster’s long academic career and continued quest for understanding animal development. After earning a bachelor’s degree in animal science from Rutgers University in 1953, Dr. Brinster planned to continue his education, but the Korean War was underway. Dr. Brinster became a second lieutenant in the United States Air Force and served a year in Korea, after which he finished his military commitment in Texas. Still, he did not lose sight of his intention to attend veterinary school. He started Penn Vet in 1956, putting the GI Bill benefits to good use financing his education. “I was not a great student as an undergraduate; therefore, I was fortunate to be accepted at Penn Vet,” recalled Dr. Brinster. “My intent was to work with large animals, but I became more interested in fertility of animals and germ cell biology; thus, following graduation I began PhD training in physiology at Penn Medicine.” Dr. Brinster earned his PhD in 1964, and made nearimmediate and long-lasting impacts in science. Dr. Brinster’s first major breakthrough came from research leading to his PhD. It was this research in the early 1960s that led to the development of an effective and reliable system in which to observe and experiment on eggs and embryos outside of the body. By using a culture method that consisted of placing mouse embryos in culture medium under an oil layer, Dr. Brinster created a system that would be adopted by the scientific community almost immediately. The system is still used today – virtually unchanged – as the go-to technique for experiments involving mammalian eggs and embryos, including all transgenic work, embryonic stem cell research, in vitro fertilization in humans, cloning and knockout technology. But creating this system was just a first step for Dr. Brinster. Next he planned to manipulate the germ line and germ cells to further understand their development and regulation. Thinking back to his childhood on the farm and appreciating the need for producing quality livestock, Dr. Brinster said, “I never lost interest in animal breeding and eventually became more and more interested in fertility, specifically the germ line. I wanted to modify the germ line and germ cells to understand how they function.” Using a mouse model, a standard species in the field of genetics because of their short reproductive time of three weeks and their well-defined genetic background, Dr. Brinster in the early 1970s began his work towards transgenesis. By taking stem cells from mouse teratocarcinomas and injecting them into mouse blastocysts, Dr. Brinster was able to demonstrate, through a series of experiments, that the non-embryo injected cells amazingly became part of the developing mouse tissues and were present in the adult. This series of experiments illustrated that donor cells, which could be cultured in vitro and modified genetically, would become part of the adult mouse. Therefore, such cells could carry genetic change into the mouse and into its germ cells, thus permanently altering the germ line of the animal. “The germ cells are critical cells,” said Dr. Brinster. “They are the only cells in the body that will pass DNA to the next generation.” While he and other scientists continued to develop and perfect this approach with stem cells to alter the germ cells and germ line, Dr. Brinster began to explore and perfect another approach to germ line modification. He initiated these experiments by demonstrating in 1980 that fertilized one-cell mouse eggs could be injected with nucleic acids and survive. He and others then used this approach to introduce new genes into the adult mouse by injecting them into the fertilized egg. He and Richard Palmiter of the University of Washington published a foundation paper in 1981 demonstrating the integration and expression of a transgene in mice. The following year, they published the famous giant mouse experiment, which appeared as the cover story in the journal Nature in 1982 and was reported on the front page of newspapers throughout the world. In this transformational experiment, they demonstrated that the growth hormone transgene produced rapid growth and large size in the mouse, and the results catalyzed interest in transgenesis. A picture of the mice appears in most textbooks as representing the beginning of the transgenic revolution. “When we saw the giant mouse,” said Dr. Brinster, “we were surprised and delighted. The giant mouse experiment was a fantastic experiment. That is the experiment that made everybody, including us, stop and say, ‘This is incredibly powerful.’ That you could enter the germ line and make a change like that. It’s the first time man was able to experimentally modify the genetic code that will make the next individual.” The implications of this success are far-reaching and include the possibility of understanding the origin of animal and human diseases, as well as studying the mechanisms by which a single cell, the fertilized egg, develops into a complex animal. Dr. Brinster has recently turned his attention to spermatogonial stem cells (SSCs), the foundation stem cells of the male germ line and spermatogenesis. SSCs self-renew and generate daughter cells to differentiate into spermatozoa throughout the entire lifespan of the male. “I started thinking about the male germ line, and I reasoned that if you took cells from a fertile testis and injected them into the seminiferous tubules of an infertile testis, they should be able to restore fertility to the animal,” said Dr. Brinster. Of all the testis cells transplanted, only the spermatogonial stem cells would colonize the testis and be able to regenerate complete spermatogenesis. “It was a simple concept; I am surprised no one did it before.” This transplantation system is now used worldwide to study and experiment on male germ line stem cells and spermatogenesis in all species. Dr. Brinster has used the transplantation system to develop cryopreservation and culture methods for spermatogonial stem cells of rodents and higher species, including primates. These techniques make individual male germ lines and their genetic content biologically immortal for all mammalian species. Clearly, the approaches Dr. Brinster has developed in the male mirror those that he introduced for the female back in the 1960s. They will be useful to preserve and genetically modify the germ lines of farm animals to increase productivity and health. Nice story and interview by Penn Vet. It’s good to read about the history, timeline of discovery, and important works that led to breakthroughs in biology. 1989 Distinguished Service Award of US Department of Agriculture. Our group uses genetic techniques to study the role of neuromodulators in the development and function of the mammalian nervous system. Most neuromodulators are polypeptides or amino acid derivatives. They are packaged in synaptic vesicles and released into the synaptic cleft upon neuronal stimulation where they modulate the activity of neurons by binding to membrane receptors coupled to G-protein-linked signaling pathways. Our group has been studying the role of the catecholamines, norepinephrine and dopamine, by making mice in which enzymes required for their biosynthesis have been inactivated.Mice that cannot synthesize dopamine develop normally but they become hypoactive and die of starvation a few weeks after birth. Treatment with L-dopa restores dopamine and restores locomotion and feeding and most other behaviors for about 8 hours. Thus, it is possible to study the same mice in either a dopamine replete and dopamine depleted state. Using this model, we have been examining the roles of dopamine in motivation, reward and learning. We also use viral gene therapy strategies to restore dopamine signaling to particular brain regions to ask where dopamine is needed for particular behaviors. We have begun using genetic techniques to manipulate the activity of dopamine neurons. For example, we have removed NMDA receptors from dopamine neurons to reduce excitatory glutamatergic input and discovered that those mice cannot remember where pleasurable events occur. Next, we will be expressing genes into dopamine neurons that will allow pharmacological activation or inactivation of dopamine neuron activity to allow us more directly assess the role of dopamine neurons in various behaviors. Another area of interest involves the role of hypothalamic neurons that express a neuropeptide called agouti-related protein (AgRP). This small population of neurons is involved in the regulation of appetite and metabolism. We devised a method to selectively kill these neurons and discovered that mice die of starvation. A few days after killing AgRP neurons, the mice neither initiate feeding voluntarily nor swallow much liquid diet even if it is introduced directly into their mouth. Thus, we believe sudden loss of these AgRP neurons disrupts the normal motivational and consummatory systems that control feeding behavior. In addition to AgRP, these neurons make neuropeptide Y and gamma-amino butyric acid (GABA). We have eliminated AgRP and NPY as being critical players in the starvation phenotype and are currently concentrating on the role of GABA. Richard Palmiter uses genetic and viral transduction techniques to discern neural circuits that control mouse behavior. He is particularly interested in neural circuits that control appetite. The central nervous system (CNS) integrates environmental sensory information (sight, sound, smell, taste, and touch) with signals from the body (sensory information from internal organs and hormones) to generate appropriate movements. The CNS can learn to associate particular sensory cues with subsequent events to facilitate appropriate responses—either approach or avoidance behaviors. Our laboratory uses genetic manipulations in the mouse to examine the neural circuits (the wiring diagrams) involved in these responses and the signaling molecules (neurotransmitters/neuromodulators) that are used by the neurons in the circuit. The neural circuits that mediate essential behaviors that do not require thought are likely to be hardwired, although still subject to modulation. Complete neural circuits have not been defined for most basic behaviors in mammals. However, genetic and viral tools are being developed that are promoting rapid progress. We are using these techniques to decipher neural circuits that promote or inhibit feeding behavior. Neurons in an area of the brain called the arcuate region of the hypothalamus (ARC) integrate hormonal (insulin, leptin, and ghrelin) and neuronal inputs to modulate food intake and metabolism as a means of maintaining adequate energy supplies for bodily needs. One population of neurons in the ARC that has received considerable attention expresses γ-aminobutyric acid (GABA), neuropeptide Y, and agouti-related protein (AgRP) as neurotransmitters/neuromodulators. Because AgRP is expressed exclusively in these neurons, we refer to them as AgRP neurons. 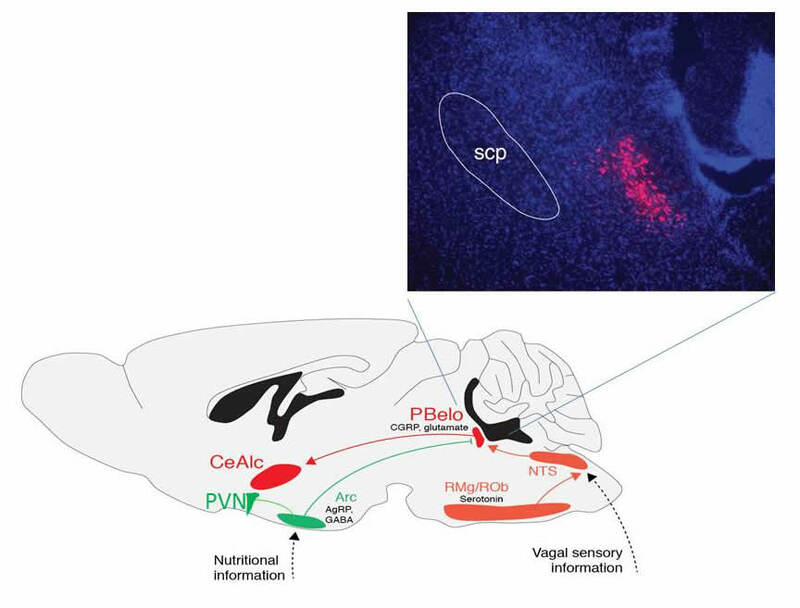 These neurons become active when an animal is hungry and promote feeding behaviors by releasing their transmitters in various regions of the brain to activate the next neurons in the circuit. Genetic manipulation of AGRP neurons is relatively easy because one can target the expression of new genes to the Agrp gene locus by homologous recombination in embryonic stem cells and then derive mice carrying that genetic modification. If Cre recombinase is targeted to these AgRP neurons, then a virus carrying a Cre-dependent effector gene can be injected into the ARC and the effector protein will be expressed only in AgRP neurons. One useful effector gene is channelrhodopsin (ChR2),a light-activated ion channel that causes neurons to release transmitters when activated by a laser connected to an optic fiber inserted just above the ARC. Photo activation of AgRP neurons during the day when mice are usually sleeping stimulates robust feeding behaviors. Scott Sternson, a group leader HHMI’s Janelia Farm Research Campus, has exploited this clever technique. We performed a converse experiment by making mice that expressed the human diphtheria toxin receptor from the Agrp locus and then administered diphtheria toxin, which killed the AgRP neurons. As might be expected, if these neurons are important for feeding, the demise of AgRP neurons in adult mice led to starvation. To understand why the mice starve after ablation of AgRP neurons, we assumed that loss of inhibitory signaling by these AgRP neurons resulted in hyperactivity of postsynaptic neurons elsewhere in the brain, which then promoted anorexia. Through a series of experiments, we discovered that hyperactivity of neurons in a brain region called the parabrachial nucleus (PBN) was responsible for the anorexia. We exploited the location of the hyperactive neurons in the PBN and coincidence with the expression pattern of the Calca gene encoding calcitonin gene–related protein (CGRP) to make a mouse that expresses Cre recombinase from the Calca locus. Viral delivery of Cre-dependent ChR2 to the PBN of the Calca-Cre mice followed by photoactivation revealed that excitation of these CGRP-expressing neurons inhibited feeding by hungry mice. Furthermore, we used another strategy to chronically inhibit these neurons and prevented starvation after ablation of AgRP neurons, providing strong evidence that loss of AgRP neurons promotes starvation by activating the CGRP neurons. These CGRP neurons are known to relay sensory information to the forebrain. They are normally activated by visceral malaise (e.g., food poisoning), nausea (e.g., motion sickness), satiety, and probably many other conditions that lead to anorexia. Thus, activation of these neurons provides a brake on normal feeding activity and presumably protects mice from dangerous environmental events. The phenomenon of conditioned taste aversion, in which ingestion of a novel food is followed by visceral illness and consequent aversion to consuming that food in the future, depends on this circuit. This is a long-lasting, one-trial learning experience that is of obvious value to a foraging animal. Photoactivation of CGRP neurons coincident with presentation of a novel food is sufficient to establish an aversion to eating that food. The CGRP neurons also mediate the aversive effects of a foot shock: blockade of CGRP neuron function attenuates the ability of a mouse to associate the foot shock with the location in the environment where it occurred. By selective expression of ChR2-mCherry in CGRP neurons, we visualized axon projections to the bed nucleus of the stria terminalis (BNST) and to the lateral capsule region of the central nucleus of the amygdala (lcCeA). Photoactivation of the terminals in the lcCeA inhibited feeding by hungry mice, whereas activation of terminals in the BNST had no effect. Current efforts are directed toward identifying the target neurons in the lcCeA and determining where they project their axons. We also intend to identify neurons in the hindbrain that directly activate CGRP neurons. These efforts should help to define the neural circuit that leads from the viscera to the amygdala and beyond. Ablation of AgRP neurons in adult mice results in starvation by activating the CGRP neurons. We have discovered numerous ways to prevent the hyperactivation of CGRP neurons and thus prevent starvation, including genetic downregulation of glutamatergic signaling onto CGRP neurons, pharmacological activation of GABA signaling onto CGRP neurons, and prior treatment with lithium chloride. Remarkably, after a week or so of these interventions, the mice survive without their AgRP neurons, suggesting that some form of adaptation has taken place such that the appetite-enhancing role of the AgRP neurons is no longer necessary for adequate feeding. We suspect that adaptation involves synaptic plasticity within the CGRP neurons and plan to use electrophysiological techniques to discern the mechanisms.